Pterostilbene is a chemical cousin of resveratrol. Both are naturally-occurring, with trace amounts in grapes, wine, blueberries and other berries. Both are a kind of natural antibiotic, produced by plants in self-defense when they are threatened with a fungal infection. In 2003, resveratrol made a splash in the press after an MIT lab found that it was able to activate longevity genes called “sirtuins” that we share with mice and many lower species—even yeast cells. This story was told alongside the “French paradox”—how are the French able to eat a rich diet and still have low rates of heart disease? Maybe the answer was to be found in the red wine which is a staple of French dining, and maybe resveratrol is the active ingredient in red wine? Following the news from MIT, there was a flurry of interest in resveratrol, both from the health community and from university labs around the world. Health enthusiasts began taking resveratrol without waiting for the results. Resveratrol became a staple on the shelves of drug stores and health food outlets. Then, over the last decade, many benefits of resveratrol were documented in different lab animals. Resveratrol extends life span in yeast cells, in lab worms, in fruit flies, and in Nothobranchius , a species of African fish that has a life span only a few months, and so is convenient for laboratory tests of longevity. Resveratrol had a perfect record, extending life span in every species that was tested, until the results came in for mice. Mice are mammals, closer to us than any of the other tested species, and resveratrol failed to extend life span in normal lab mice, though various benefits were noted, especially for obese mice on a high-fat diet. More recent research suggests that pterostilbene has similar benefits in helping mice avoid the health consequences of obesity . Before 2003, both resveratrol and pterostilbene had been known to science, but only a few researchers were interested. What changed? David Sinclair was not only a bright and productive young researcher, but an ambitious entrepreneur and publicist as well. With the force of his energy and personality, Sinclair put resveratrol on the map, and generated excitement, both in scientists and in the public and the press. It was a historic accident that so much attention was lavished on resveratrol, and comparatively little on pterostilbene. We know much less about it. There are about a thousand research articles on resveratrol coming out each year, and less than 100 for pterostilbene. There are no tests of the effect of pterostilbene on life span—not with any species of lab animal. But from the physiological effects, we might expect that pterostilbene works better than resveratrol. And, unlike resveratrol, pterostilbene is readily absorbed by the body. Pterostilbene has its own history, far older than the French wine connection. Pterostilbene was recognized in the Ayurvedic tradition of South Asia, and used as a heart tonic in the form of darakchasava . The first recorded use of darakchasava was in India around 400 AD, and is written up in a Sanskrit text called Sushruta Samhita. Resveratrol and pterostilbene are strong anti-inflammatories, with inhibition of both COX-1 and COX-2 [4,5]. COX-2 inhibition is the important one, associated with lower risk of cancer and dementia, while COX-1 has mixed benefits and problems. Both pterostilbene and resveratrol show activity against cancer  cells in cell cultures. Both pterostilbene and resveratrol are powerful anti-oxidants, but this is probably not the source of their benefit. The whole oxidative theory of aging has been in decline  for quite some years, since the failure of anti-oxidant vitamins to extend life span [8, 9]. When pterostilbene is directly compared to resveratrol in cell cultures and animal studies, often pterostilbene performs better. For resveratrol, questions of dosage have still not been resolved, despite a decade of research. The problem is that experimental results have led in contradictory directions. Commercial capsules of resveratrol tend to be between 50 and 250 mg. For comparison, a glass of red wine might have a small fraction of 1 mg . Is more better? In life span experiments with various animals, often the highest dose does not correspond to the longest life span. And, more bewildering yet, the “optimal” dosage varies depending on the species and the way in which it is administered. In one study with mice, enormous doses created mice with superpowers of endurance and strength, but they did not live longer. It is common in experiments with mice to give doses equivalent to 100 pills a day for humans, or a small swimming pool full of red wine . Compared to resveratrol, pterostilbene is found in much smaller quantities in fruits and berries. A pint of blueberries has only 0.03 mg. But pterostilbene is far more bioavailable than resveratrol. About 20 times as much is absorbed by the body, and it lasts in the body up to 7 times longer . Nothing is known about optimal dosage in animals, let alone in people. There are many studies conducted in cell cultures grown in a petri dish in a lab, demonstrating that pterostilbene kills cancer cells, or slows their growth, or causes normal cells not to progress into cancer cells when they are chemically attacked. For example, pterostilbene sends lung cancer cells into self-destruct mode, inducing apoptosis (programmed cell death) . Pterostilbene inhibits the inflammatory action of NFκB , and slows the growth of colon cancer cells . There are many more such studies, because cell culture studies are comparatively easy and inexpensive. In addition to lung and colon cancers, pterostilbene has been found to have activity against cancers of the liver, blood, skin, pancreas, prostate, and stomach. But the next step is to ask whether pterostilbene can cure cancer in a live animal; or better yet, do mice that are fed pterostilbene have a lower cancer risk than mice without pterostilbene? There are as yet very few of these live studies. Rats were fed pterostilbene (or a control diet) and challenged with a chemical that induces colon cancer. The pterostilbene rats had modestly lower incidence of colon cancer . Another study found that pterostilbene had a more powerful effect than resveratrol in preventing colon cancer . Pterostilbene lowered the rate of metastasis for liver cancer . Similar benefits were found for slowing growth of pancreatic cancer . Type II Diabetes is a disease with growing prevalence in the Western world, driven by high-carbohydrate diets and increasing rates of obesity. But even for people who are keeping their weight down and their exercise up, blood sugar regulation tends to get worse with age, and this contributes to all the diseases of old age. Loss of insulin sensitivity causes the body to pump out more insulin, which causes further loss of sensitivity. It happens to all of us, if we live long enough. Pterostilbene can help retain insulin sensitivity. Rats fed a hi-carb diet were protected from diabetes in a manner comparable to the long-time champion prescription drug, metformin . Pterostilbene lowered blood sugar in diabetic rats . AMP Kinase (AMPK) is a master hormone that stimulates cells to pull sugar out of the blood. This means more sugar burned, less stored as fat. Metformin works in this way, and pterostilbene has also been found to activate AMPK . Metformin is a known anti-aging drug, extending life span in rodents and lowering mortality rates in humans. Maintaining insulin sensitivity has a ripple effect that helps prevent heart disease, strokes, dementia, and cancer—the four major killers. We know that pterostilbene works on some of these same pathways, but we don’t yet have the data to know whether it extends life span in rodents or lowers mortality rates in humans. 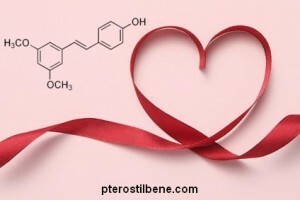 A 2005 study from US Dept of Agriculture  reported that pterostilbene beats out resveratrol in its effect on the HDL/LDL ratio in the blood (more “good cholestrol”, less “bad cholesterol”). Tests were performed with hamsters. In a 2012 manufacturer-sponsored drug trial, pterostilbene was found to lower blood pressure in middle-aged people at elevated risk for heart disease. The reduction was about 7mm. Lowering blood pressure doesn’t always lead to lower rates of heart disease; for example simply cutting down on salt can lower blood pressure, but it does so for the wrong reasons, and heart disease risk actually rises on a low-salt diet. But pterostilbene seems to be lowering blood pressure in the right way: by chemically reducing plaques (obstructions) in the arteries, and making the artery walls less stiff. There is good reason to think that pterostilbene can lower risk of heart disease, but this study has not yet been done. Endothelial cells line our arteries, and in healthy, young people they are constantly being replaced in a process of “remodeling”. But as we get older, healthy endothelial cells commit suicide (apoptosis, again), and the integrity of the arteries is compromised . This is one of the striking ways that the body seems literally to be destroying itself at older ages, and it contributes substantially to heart disease and strokes. Pterostilbene lowers the rate of apoptosis in endothelial cells, helping to delay heart disease and stroke by maintaining the integrity of the arterial walls . This benefit is the more impressive when remember that pterostilbene increases the rate of apoptosis in cancer cells. There seems to be a double benefit from pterostilbene, helping to preserve healthy cells and get rid of malignant ones. In a 2012 study out of Case Western Reserve , mice were bred to be vulnerable to Alzheimer’s disease, and pterostilbene—but not resveratrol—helped delay the disease. Using spatial memory tests that are standard for rats and mice, they showed that the mice actually improved performance when fed pterostilbene. Rats show a decline in memory with age that can be measured in the lab, and various stilbenes (including resveratrol) were tried to bring the rats’ memory back. Pterostilbene worked best . The same study showed that pterostilbene could help maintain levels of dopamine, suggesting that it might be useful in preventing Parkinson’s disease. A number of studies have reported memory improvement and neuro-protective effects of blueberries in humans [26, 27] and in animals [28, 29], but none, to my knowledge, has tried to identify whether pterostilbene was the active agent in blueberries responsible for the benefit. Several authors have written speculatively about pterostilbene as a general anti-aging tonic [25, 30,31]. I think we just don’t know yet. It has become increasingly clear  that aging is more about gene expression than about genes. Which genes get turned on, when and where? This is the science of epigenetics. The body has the same genes throughout the life span, but genes are turned on and off to choreograph all the changes that take place during development of the embryo, growth, and puberty. Gene expression continues to change, more slowly, after puberty, and genes for protection, regeneration and detoxification are turned off when we need them most. Certain genes are turned on late in life, with devastating effects on the body, promoting cell death and raising inflammation to dangerous levels. SIRT genes have the effect of keeping these harmful genes silent, shutting them off. In this way, they suppress one of the core causes of aging. It was the connection with SIRT that put resveratrol on the map, but curiously, the SIRT connection has become quite controversial. Some labs claim a strong connection between resveratrol and SIRT expression, while others, doing very similar experiments, find no connection whatever. The difference remains unresolved, even as it has become the subject of heated debate. Whether pterostilbene activates SIRT is a subject that has barely been investigated, but here  is the one study I found, claiming that neither pterostilbene nor resveratrol activated SIRT in mice. A Japanese study  claims that resveratrol does activate SIRT, and that pterostilbene is almost twice twice as potent. Meanwhile, there are other epigenetic benefits from both pterostilbene and resveratrol that have been well-documented, including AMPK activation and NFkB suppression, as I have mentioned. Benefits of resveratrol are well-documented because there has been so much money and lab time devoted to studying it in the last decade, both in animals and in humans. Pterostilbene is a similar compound, rarer and more bioavailable. There is some reason to believe that pterostilbene might have health and anti-aging benefits that surpass resveratrol, but we won’t know for sure until the studies are done. Though there are many studies for the effect of resveratrol on various animals, including rodents, there is only one study , to my knowledge, that included pterostilbene in testing longevity in mice. In this study, from the Spindler lab at University of California, mice were given a combination of many neutraceuticals, including blueberry extract containing a small amount of pterostilbene, and the combination did not affect life span. Pterostilbene deserves a study all its own. Note: After preparing this article, I learned about Examine.com, which would have saved me a great deal of time and searching. The site includes an index to articles about hundreds of different supplements. 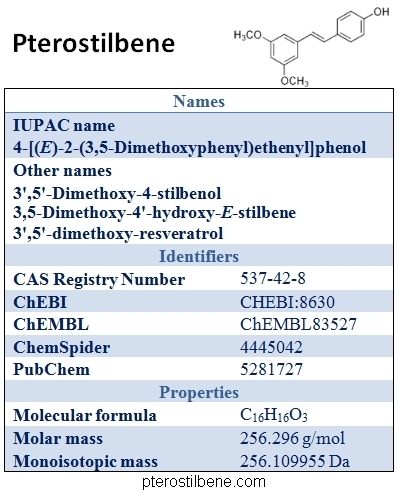 There are, at the time of this writing, 55 references on pterostilbene. About the author: Josh Mitteldorf takes a unique view of health and aging, based on the genetics and evolution of aging. His research has been published in evolutionary journals as well as journals of medical gerontology. In addition to his academic work, Josh publishes a weekly blog for the scientific public, covering different aspects of aging, and a page of health advice for longevity. 1. Valenzano, D.R., et al., Resveratrol prolongs lifespan and retards the onset of age-related markers in a short-lived vertebrate. Curr Biol, 2006. 16(3): p. 296-300. 2. Gómez-Zorita, S., et al., Pterostilbene, a Dimethyl Ether Derivative of Resveratrol, Reduces Fat Accumulation in Rats Fed an Obesogenic Diet. Journal of Agricultural and Food Chemistry, 2014. 62(33): p. 8371-8378. 3. Paul, B., et al., Occurrence of resveratrol and pterostilbene in age-old darakchasava, an ayurvedic medicine from India. Journal of Ethnopharmacology, 1999. 68(1–3): p. 71-76. 4. Cichocki, M., et al., Pterostilbene is equally potent as resveratrol in inhibiting 12‐O‐tetradecanoylphorbol‐13‐acetate activated NFκB, AP‐1, COX‐2, and iNOS in mouse epidermis. Molecular nutrition & food research, 2008. 52(S1): p. S62-S70. 5. Hougee, S., et al., Selective COX-2 inhibition by a Pterocarpus marsupium extract characterized by pterostilbene, and its activity in healthy human volunteers. 2005. 6. Rimando, A.M. and N. Suh, Biological/chemopreventive activity of stilbenes and their effect on colon cancer. Planta medica, 2008. 74(13): p. 1635. 7. Sanz, A., R. Pamplona, and G. Barja, Is the mitochondrial free radical theory of aging intact? Antioxid Redox Signal, 2006. 8(3-4): p. 582-99. 8. Hollar, D. and C.H. Hennekens, Antioxidant Vitamins and Cardiovascular Disease: Randomized Trials Fail to Fulfill the Promises of Observational Epidemiology, in Antioxidants and Cardiovascular Disease. 2006, Springer. p. 305-325. 9. Duffield-Lillico, A.J. and C.B. Begg, Reflections on the landmark studies of β-carotene supplementation. Journal of the National Cancer Institute, 2004. 96(23): p. 1729-1731. 10. McCormack, D. and D. McFadden, Pterostilbene and cancer: current review. Journal of Surgical Research, 2012. 173(2): p. e53-e61. 11. Wu, R.-E., et al., Resveratrol protects against physical fatigue and improves exercise performance in mice. Molecules, 2013. 18(4): p. 4689-4702. 12. Schneider, J.G., et al., Pterostilbene inhibits lung cancer through induction of apoptosis. Journal of Surgical Research, 2010. 161(1): p. 18-22. 13. Paul, S., et al., Anti-inflammatory action of pterostilbene is mediated through the p38 mitogen-activated protein kinase pathway in colon cancer cells. Cancer Prevention Research, 2009. 2(7): p. 650-657. 14. Paul, S., et al., Dietary intake of pterostilbene, a constituent of blueberries, inhibits the β-catenin/p65 downstream signaling pathway and colon carcinogenesis in rats. Carcinogenesis, 2010. 31(7): p. 1272-1278. 15. Chiou, Y.-S., et al., Pterostilbene is more potent than resveratrol in preventing azoxymethane (AOM)-induced colon tumorigenesis via activation of the NF-E2-related factor 2 (Nrf2)-mediated antioxidant signaling pathway. Journal of agricultural and food chemistry, 2011. 59(6): p. 2725-2733. 16. Pan, M.-H., et al., Pterostilbene inhibited tumor invasion via suppressing multiple signal transduction pathways in human hepatocellular carcinoma cells. Carcinogenesis, 2009. 30(7): p. 1234-1242. 17. McCormack, D.E., et al., Genomic analysis of pterostilbene predicts its antiproliferative effects against pancreatic cancer in vitro and in vivo. Journal of Gastrointestinal Surgery, 2012. 16(6): p. 1136-1143. 18. Grover, J., V. Vats, and S. Yadav, Pterocarpus marsupium extract (Vijayasar) prevented the alteration in metabolic patterns induced in the normal rat by feeding an adequate diet containing fructose as sole carbohydrate. Diabetes, Obesity and Metabolism, 2005. 7(4): p. 414-420. 19. Manickam, M., et al., Antihyperglycemic activity of phenolics from Pterocarpus marsupium. Journal of natural products, 1997. 60(6): p. 609-610. 20. Rimando, A.M., et al., Pterostilbene, a new agonist for the peroxisome proliferator-activated receptor α-isoform, lowers plasma lipoproteins and cholesterol in hypercholesterolemic hamsters. Journal of agricultural and food chemistry, 2005. 53(9): p. 3403-3407. 21. Lin, V.C.-H., et al., Activation of AMPK by pterostilbene suppresses lipogenesis and cell-cycle progression in p53 positive and negative human prostate cancer cells. Journal of agricultural and food chemistry, 2012. 60(25): p. 6399-6407. 22. Affara, M., et al., Understanding endothelial cell apoptosis: what can the transcriptome, glycome and proteome reveal? Philosophical Transactions of the Royal Society B: Biological Sciences, 2007. 362(1484): p. 1469-1487. 23. Zhang, L., et al., Pterostilbene protects vascular endothelial cells against oxidized low-density lipoprotein-induced apoptosis in vitro and in vivo. Apoptosis, 2012. 17(1): p. 25-36. 24. Chang, J., et al., Low-dose pterostilbene, but not resveratrol, is a potent neuromodulator in aging and Alzheimer’s disease. Neurobiology of aging, 2012. 33(9): p. 2062-2071. 25. Joseph, J.A., et al., Cellular and behavioral effects of stilbene resveratrol analogues: implications for reducing the deleterious effects of aging. Journal of agricultural and food chemistry, 2008. 56(22): p. 10544-10551. 26. Krikorian, R., et al., Blueberry Supplementation Improves Memory in Older Adults†. Journal of agricultural and food chemistry, 2010. 58(7): p. 3996-4000. 27. Joseph, J.A., et al., Reversals of age-related declines in neuronal signal transduction, cognitive, and motor behavioral deficits with blueberry, spinach, or strawberry dietary supplementation. The Journal of Neuroscience, 1999. 19(18): p. 8114-8121. 28. Joseph, J., et al., Blueberry supplementation enhances signaling and prevents behavioral deficits in an Alzheimer disease model. Nutritional neuroscience, 2003. 6(3): p. 153-162. 29. Goyarzu, P., et al., Blueberry supplemented diet: effects on object recognition memory and nuclear factor-kappa B levels in aged rats. Nutritional neuroscience, 2004. 7(2): p. 75-83. 30. Estrela, J.M., et al., Pterostilbene: Biomedical applications*. Critical reviews in clinical laboratory sciences, 2013. 50(3): p. 65-78. 31. Kasiotis, K.M., et al., Resveratrol and related stilbenes: Their anti-aging and anti-angiogenic properties. Food and Chemical Toxicology, 2013. 61: p. 112-120. 32. Rando, T.A. and H.Y. Chang, Aging, rejuvenation, and epigenetic reprogramming: resetting the aging clock. Cell, 2012. 148(1): p. 46-57. 33. Kahyo, T., et al., A novel chalcone polyphenol inhibits the deacetylase activity of SIRT1 and cell growth in HEK293T cells. Journal of pharmacological sciences, 2008. 108(3): p. 364-371. 34. Spindler, S.R., P.L. Mote, and J.M. Flegal, Lifespan effects of simple and complex nutraceutical combinations fed isocalorically to mice. Age, 2014. 36(2): p. 705-718. This is great stuff. Hope these anti aging treatment will be available soon. I’m reaching thirty years of age, and have been pretty jipped out of life and would like to add as much time as I can. Keep up the good work. test. Any thoughts on the idea? bio-avaiability than the 105 minutes taken as a concentrate, in a capsule. and a half. Had to walk a mile tonight to be ready for my sleep…Bood this morning a super healthy 94!!! You may have read my earlier post regarding pterostilbene used with 1500 mg of slow relese metformin. I posted last on Sep. 8. It is now October 22, 2015’Since starting on the addition of pteorstlbene (100 mg daily) I have lost 16 lbs. by a combination of portion control in eating and taking the pterostilbene with living blueberries to influence the digestion to give me a longer period of bio-avaiability. I take two finger-stick samples of blood daily. I am now getting results in the eighties & nineties. An irritation of the bladder get resolved, and I think the pterostilbene has halped to control appetite. So far, very encouraging results. It is now November 23, a month later. I have now been able to lose 24 lbs. provide ptereostilbene as a support for the medicinal effects of metformin. carotid endarterectomy (now, left side pair). It has gone extremely well! for my approaching 76th birthday, in April! hi…Silliphant what years did you serve? I served with someone with your last name and he was from California.